Very easy to use. Handy and quick results. I kept them in an extra container to ensure they are dry at all times. Just incase water gets in. Instant readings and easy to use. They make it very easy to read and compare with the vial to ensure that you are meeting sanitizer requirements. Chlorine test strips work for our bleach water sanitation. Easy to read. Just don't drop the open contain in water and you'll be golden. Cheap and should last. Loved that these were so inexpensive. I haven't tried them yet, but I am confident that they will work well. Met all of my expectations. these are a great easy and simple way to insure our bleach water is the correct strength. Very easy to use and read, will get again! We love these test strips. Really great priced strips for sanitize sink. I always make sure my employees know how to use these test strips every-time they prepare the sinks for dishes. These test strips work amazing!! I always thought I wasn't putting enough Clorox in my sink. Turns our i was putting way too much!! These definitely help so I put just the right amount in! Great to have on hand the test levels in self clorinated stored water. At this price I can use one for every container we store and use. This is a must have in your business! These are exactly what you need for when the health department comes. They are so affordable that I stock up about 4 or 5 at a time & put them in a safe place just incase one gets lost. I really like these chlorine test strips because they are the ones that are recommended with the Noble dishwasher that I got and the health department loves them. Test strips are a must to pass health inspections, This has more than enough strips to test Chlorine levels. Most santizer tablets utilize chlorine. Make sure to keep these near the dish machine! These strips are a must have with our local health department. They are really affordable and make checking your levels a no brainer. The test strips are all connected so you just tear them apart as needed. Does what its suppose to, I got no problems with its accuracy and the health department supervisor got no problem with us using it in the kitchen. these test strips are so easy to use. we use these to test the bleach water level when we use it for sanitizing toys and other items. These were a crucial component to passing our health inspection today and we use them frequently to ensure that our sanitization levels of our cleaning solutions. These strips perform well and exactly as described. Packaged well with simple to follow instructions . Make sure before opening vial that your hands and work area are clean/dry. Strips inside of vial are packaged together and have to be torn from each other. The product is moisture sensitive and very easy to use. Simple product, easy to read bleach ratio. 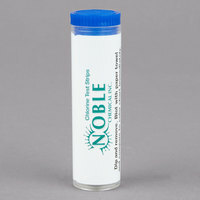 We definitely suggest the Noble Test Strips, they are overall pretty self explanatory and make a great addition to our HACCP plan. I know these chlorine test strips is for keeping chlorine levels safe and effective for washing dishes and pots and pans but I thought I would try them on my pool. It was hard to read for that situation. This chlorine test strips is exactly what we need for restaurant business and it is so affordable too! I'll definitely recommend it everyone and will buy again and again. Excellent product and works really well. Nobody really likes having to check their sanitizer solution but when you have to just use these little strips. They are super easy to use. These test strips were great I’ve never had a problem with them they give accurate readings and they’re very handy for inspections . I recommend them for anyone . I like these chlorine test strips. They are really handy to have in the kitchen to test for the right amount of chlorine in our sanitizing solution. And I like that there's a hundred in this tiny little vial. The price is great too. These Chlorine Test Strips are important to have for testing purposes the health inspector will most likely ask for them when they visit! We recommend. Every restaurant should have this on hand. Very cheap, but works perfect. 100 strips in this 1 Vial, It will last you pretty good amount of time. These are great to have in the kitchen when you need to do a quick check on the chemical levels in your sinks. They're easy to read, then just toss. No mess. These test strips are very easy to use. It only took one one demonstration for all the workers to learn. The vial has 100 of them, enough for 3 months of testing twice a day. They are also a great price compare to other brands. These are a must in the food service industry because you must test the water to ensure the proper dilution of bleach to water. These strips work well and are easy to read. Essential if you are using chlorine to sanitize at your restaurant. Very easy to use. The only thing I can complain about is that the top is a little hard to pop off the vial. Otherwise, very good product for the price. These work as required and I like the pre cut strips. It’s is less of a chance that I will ruin the whole roll with wet fingers. Such a great and easy product to use to test everything from our water to dishwasher to sanitize bottles. We would highly recommend - great price and quality. They are test strips, what can I say. They are in a smaller tube and smaller size so that is a nice convenience. They work well and work quickly. Work as well as the one the ECOLAB rep gave me. You need to have your dishwashers check the chemical content of the sanitizers in the machine and sinks! It is not only more sanitary but can avoid health department issues. In order to measure chlorine levels in your sanitizer water you must use test strips. This will ensure your safety as well as properly indicate the levels of chlorine in the water. These test strips are very inexpensive income in vials of 100. Stay on the good side of your inspector and be sure your sani is properly concentrated. test strips work just fine for what we need - but the webstaurant label completely covered the manufacturer label so it had to be peeled and scrubbed off before use which was a pain. Great test strips. Easy to store until needed. Theyre always accurate, so you know if the solution is too strong or weak. Great product here. Great addition for our safety concerns. Health inspector very happy with testing and we are very happy with this purchase. Weill buy again as needed. These are a must-have item if you are using bleach or chlorine to sanitize your dishes. Very easy to use, and buying them here will save you some money. Very Accurate Test Strips. We use these chlorine test strips once a week on our 4 300 Gallon fish tanks. Results are fast and accurate. A great value, especially the 100 pack since we use so man of these. Testing chlorine is a daily task and multiple times per day. These strips make it quick and easy to do during the chaos that is often occurring when it needs to be tested. Great price point. I accidentally order these instead of the quarternary test strips. I keep them around though for homebrewing when sanitizing bottles and buckets with bleach and they work nicely. Great price for these chlorine test strips. Works great to verify the chlorine amount in the sanitizer water in our 3 compartment sink, which is required by the health department. Easy to use. Handy and quick results. while container provided is water resistant, we keep ours in a plastic bag or additional water proof container just to be sure that all in the provided container do not get wet if keeping in dish area.